Sea Kale & Hazelnuts – Dig Delve – An online magazine about gardens, landscape, growing & making. Sea kale has a fairly short season from late February to mid April and, unless you have space for a lot of plants, each plant can only produce a limited harvest. This scarcity, even in the home garden, means that it is not an ingredient to be fussed with. As with all forced vegetables, sea kale is prized for its delicate flavour and texture, so it is essential to choose companion ingredients that work to foreground its subtle flavour, which has undertones of asparagus, cabbage and nuts. Like the first asparagus, the beauty of this earliest of garden produce comes from the simplest treatment – lightly boiled or steamed with butter or oil and lemon juice. Perhaps a scattering of herbs – tarragon for choice. An accompanying boiled or poached duck egg makes a simple spring lunch, while a hollandaise or butter sauce elevate it to something more suited to a special occasion. Given its native habitat sea kale makes a natural companion to seafood. It complements scallops, brown shrimps or a piece of good white fish, turbot in particular. Most recently we have eaten it in the most complex manner I have attempted or would recommend, scattered with threads of white crab meat and dressed with a crab beurre blanc made from the brown meat. This simple recipe uses hazelnuts to bring out the kale’s intrinsic flavour and provide a toothsome contrast. Heat the oven to 180°C. Spread out the hazelnuts in a single layer on a baking sheet. Put this in the oven and leave the hazelnuts to roast for 15 minutes. Check them after 10 minutes to ensure that they don’t scorch. Skin the hazelnuts by rubbing them within a cloth or tea towel. Chop or crush them coarsely. Trim the ends of the sea kale stems. Bring to the boil a pan of water big enough to take the sea kale without bending the stalks. I use a wide, lidded sauté pan. Simmer for a maximum of 2 minutes. It is easy to ruin sea kale through overcooking and the stems should retain some bite. 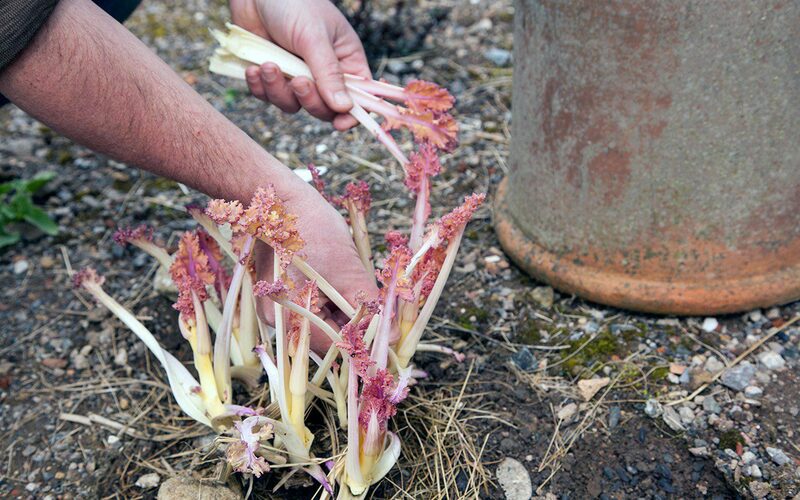 Now proceed carefully as the sea kale is very delicate and breaks easily. Drain and refresh in cold water. Drain again then pat dry with a cloth or paper towel. 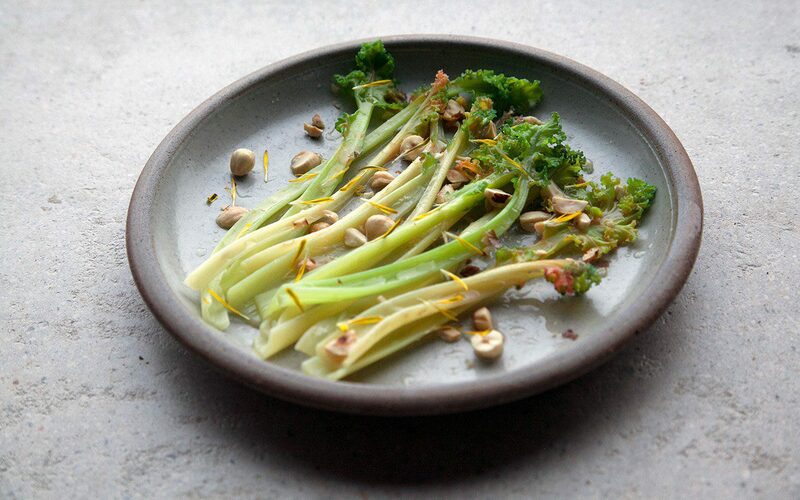 Arrange the sea kale stems on individual plates. Scatter over some of the chopped hazelnuts. Trickle over some hazelnut oil followed by a squeeze of lemon and a little sea salt. Pull the dandelion petals from the flowers and scatter over. Serve as a starter or as a side dish to accompany fish.